After riding the same road bike since 1999, I’ve decided to replace it. Just a few years ago, I had it — a Lemond Zurich — repainted. And then I put an Ultegra 6800 group on it. I just rode it and loved it in the 70-mile Tour de Tucson. But gravel bikes have turned my head. Or audax, adventure, gran fondo, road-plus, or alt-road (ick) bikes … whatever name you call it, it pretty much means more relaxed geometry, clearance for bigger tires, disc brakes and through-axles. Anyway, I’ll keep calling it a gravel bike, even though I’ll ride it on the road a good 80 percent of the time. Here’s the deal: Drivers are making more and more nervous. They get away relatively scot-free with killing and injuring cyclists. Add to that an improving but still below-par local bike infrastructure … and a multitude of unpaved canal routes, and you have a perfect place to take advantage of the “go anywhere” capabilities of a gravel bike. Also, this whole gravel-riding thing just looks fun. They can go off-road and cover ground faster than mountain bikes. They’re in their element on unpaved forest roads, which opens up possibilities to see things and go places that are new to us. So yeah, I’m in. Gravel Bikes: Build or Buy? 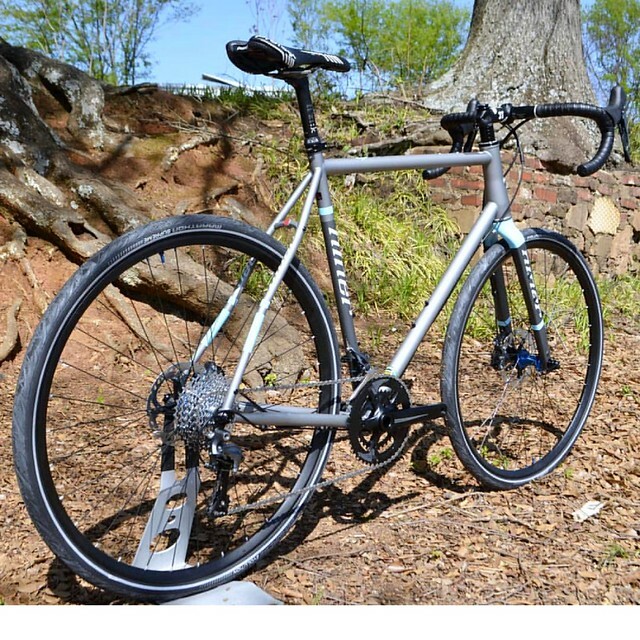 I considered buying a whole bike – I wanted steel or titanium. I love my titanium Domahidy mountain bike, and obviously the ride quality and longevity of my Lemond are strong arguments for steel. I saw quite a few bikes that I saw – The Milwaukee Mettle is wonderful; the All-City Cycles Space Horse likewise; and Fairdale’s new Rockitship looks terrific. This is just to name a few solid possibilities. I am not a big fan of the big guys like Trek, Specialized or Giant – not because their bikes are inferior, because they do what they do extremely well. I just crave a certain mojo from my bikes that the bigger brands don’t deliver. Gravel bikes and their riders getting ready to launch from McDowell Mountain Cycles in Fountain Hills, Ariz. I put myself into “scan” mode for a few months. If I found a great deal on a complete bike, I’d do it. Ultimately, I found a good frame and chose to repurpose the compatible parts on my Lemond; they’re are all relatively new and extremely solid. And I could focus on the filling bits according to my own personal vision. Now, gravel bikes are still a bit of a Wild West. Some have two chainrings, while some roll mountain bike-style with one. Some are for touring/bikepacking and need all sorts of additional places to carry stuff. There’s definitely a learning curve in learning what to look for. That’s why I’m collecting my thoughts as I start this process, and I will share with you whatever I learn. This post will link out to future posts covering some of the major details. By way of background, I used to work at a well-respected local bike shop. I’ve built and maintained my own bikes since the 90s. I leave hydraulic disc brake and suspension maintenance to others, but handle everything else myself. I’m not quite a cheapskate, but I love a good value. This rider is sporting a Lauf fork, a cool suspension fork from Iceland (aka one of my favorite places on the planet). And yes, gravel bikes are perfect in Iceland! Right now, all I have in my possession is a frame. After a lot of looking at geometry and asking a lot of questions, I landed on the Lynskey Urbano. Now, I was a little bit skeptical because it’s designated as a commuting bike on the Lynskey website. But I spent some time emailing a Lynskey sales rep, and I compared its geometry with my Lemond and with other eligible frames. The geometry is only a bit more relaxed than the Lemond, and its wheelbase is only a smidge longer. Some bikes seemed like limousines! It also has a threaded BB shell, which I prefer. Just eyeballing the Lynskey, it appears very nicely made – good welds, beefy stays, nicely shaped tubes. It’s set up for flat-mount disc brakes and 12mm through axles, and can accommodate electronic shifting. Gravel bikes hitting the backroads of Arizona. Picking a fork – and why I am convinced that carbon forks are great, but they’re also a giant rip-off. I know this will be controversial. I’m willing for someone to prove me wrong when I make the case. Sometimes I don’t know what I don’t know. Wheels … after great luck with pre-built Shimano and Stan’s wheels and spotty luck with locally hand-built wheels, I take the plunge with a reputable company that does nothing but build wheels. Their insightful blog is part of the reason I picked them in particular. Tires are almost as difficult to choose as wheels. What width? What pressure? What tread? Argh! A few thoughts about what impacted my choices beyond specs and prices, from the advice of knowledgeable friends to how companies handle themselves on social media networks. Putting it all together and riding. I’m planning to go with 31c Vittoria tires to start. My big question is whether the do-anything, go-anywhere wheels and tires make my performance take a big knock. I’m determined to do better at the 2018 Tour de Tucson, and I’m curious to see what impact riding a gravelly, road-plus bike makes on my times as I train. Special thanks to Craig Swetel from the Facebook group Riding AZ Gravel. Not only did he let me help myself to most of the photos in this post, he also is spreading the word about gravel-riding fun.